Napoleon’s venture into Egypt is well known. In 1798, he headed an invasion force of 25,000 men in an attempt to seize control of the country from the Mamelukes. His aim, apart from Egypt itself, was twofold — destroy the Ottoman Empire and gain access to India via the Red Sea with the intention of crushing the British there and taking it over as well. This was, after all the man who reputedly said while in Egypt that Europe was not big enough for him. The dream ended in disaster. First, his fleet was destroyed by Nelson at the Battle of Abukir Bay thus cutting him and his army off. Then, despite a couple of military victories against Ottoman forces, he slipped back to France, leaving his stranded army at the mercy of the Ottomans and British. In 1801, the remnants of his army had the humiliation of being repatriated in British ships. What is less well known, however, is the story, which may or may not be true, that in 1812 Napoleon sent an agent, variously known as Julien Lascaris de Ventimille or Jules-Theodore Lascaris de Ventimille, a former knight of Malta, back to the Middle East to make contact with the Bedouins ahead of a planned new French invasion. The aim was again an attack on the Ottoman Empire and again French troops marching toward India. Napoleon’s advisers reckoned that the Bedouin would know the terrain better than anyone else and that without their support French troops would not be able to cross from Damascus to Baghdad. The story is that Lascaris made contact with a number of Arab tribes and leaders and tried to persuade them to rise up and unite against Ottoman rule, promising them that France would send 100,000 troops to help if they did so. One of these leaders was supposedly Saud bin Abdul Aziz bin Muhammad bin Saud (died 1814) or Saud the Great, the third ruler of the first Saudi state based at Diriyah on the outskirts of modern-day Riyadh and ancestor of the present royal family. Whether the story is true has as yet to be proved. But there are many who are convinced it is. When earlier this year French Culture Minister Frederic Mitterrand visited Riyadh for the Janadriyah festival at which France was the guest of honor this year, he mentioned Lascaris’ tie-up with Saud the Great in his speech. Lascaris’ adventures have also been written in historic novel form by Jean Soublin (‘Lascaris of Arabia,’ published 2006, Paris), again the suggestion being that the story is true. Lascaris’ story is largely (but not wholly) based on the memoirs of a Syrian Maronite, Fathallah Sayigh, who claims to have accompanied him during his journeys into Arabia and his involvement with Saud. These were later translated by the French poet, politician and writer Alphonse de Lamartine and published in 1835. But Lascaris is also mentioned by a number of contemporary authors, for example Charles Meryon, physician to the extraordinary and eccentric Lady Hestor Stanhope, niece of British Prime Minister William Pitt the Younger; she took up residence in Lebanon. Others refer to Lascaris as having been involved in strange doings but go no further. So he certainly existed. But it is only on Sayigh’s authority that we are told of his dealings with Saud the Great. However, the story has some logic to it and reason to believe it could be true. Saud the Great was the rising power in the Arabian Peninsula at the time. He had managed to capture Makkah and had become a major thorn in the side of the Ottomans. Napoleon would have been well aware of him for it seems that Lascaris may not have been the emperor’s only agent in the field. In the Louvre exhibition is a map of Makkah printed in 1815 but probably drawn around 1807, three years before Lascaris arrived in Arabia. It was made by another adventurer, a Spaniard named Domingo Badia y Leblich. He arrived in Makkah in 1807. He called himself Ali Bey Al-Abbasi, and claimed not only to be a Muslim but a descendent of the Abbasids. The latter was certainly a lie although it impressed some. In Morocco he was treated with enormous courtesy by the sultan until one day he was suddenly expelled from the country. Possibly the truth of his spurious lineage had finally been discovered. He was an accomplished and brazen liar. In his own account of his travels, published in 1816, he openly admits he told the governor of Makkah and others that he was a Syrian from Aleppo. His claim to be a Muslim too is now thought to have been a deception in order to win the confidence of Muslim rulers and be allowed to enter Makkah and other holy places elsewhere, such as the Sanctuary of Abraham in Hebron, which he did. When he died in Syria in 1818, heading on a second journey to Makkah, he was refused Muslim burial after he was found to be wearing a cross beneath his vest. Before he went to Morocco in 1802 he was reportedly working for British interests in the region but at some point he appears to have become an agent for Napoleon, pursuing the emperor’s eastern schemes. It has been said that his death in 1818 was the result of being poisoned by the British who were determined to put an end to his intrigues on behalf of France, (Lascaris who died in Cairo two years earlier was also said to have been poisoned by the British, as was Napoleon himself), but that is probably another myth because, in 1818, Britain and France were firm friends. In any event, Al-Abbasi (as he is usually known) claims to have been in Makkah when it was taken over by Saud the Great in 1807. When he returned to Spain he held office under Napoleon’s brother Joseph Bonaparte who was installed as king of Spain in 1808. When Joseph and the French were expelled in 1813, he retreated with them to Paris and later lectured at the Institute de France. Al-Abbasi and Lascaris were real enough. Both were adventurers. Both were involved in fascinating if shady business, ostensibly on behalf of Napoleon. Both die in mysterious circumstances. Whether that makes them agents for a grand Napoleonic plan to invade Arabia is another issue although. 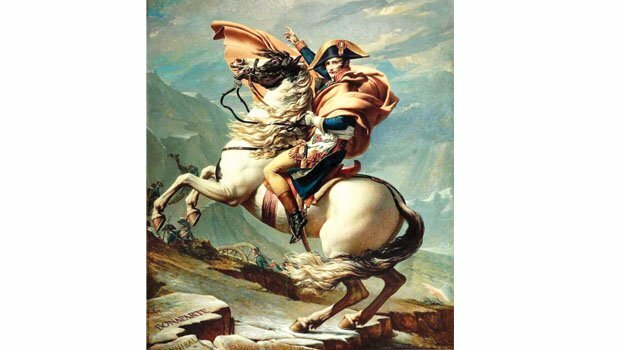 In any event, Napoleon’s disastrous campaign in Russia in 1812 and his retreat from Moscow put paid to any plans he might have had for an eastern empire.